Now that the demonization of Russia's President Vladimir Putin is in full swing, one has to wonder when the neocons will unveil their plan for "regime change" in Moscow, despite the risks that overthrowing Putin and turning Russia into a super-sized version of Ukraine might entail for the survival of the planet. There is a "little-old-lady-who-swallowed-the-fly" quality to neocon thinking. When one of their schemes goes bad, they simply move to a bigger, more dangerous scheme. Just when you think you've cornered President Barack Obama into a massive bombing campaign against Syria -- with a possible follow-on war against Iran -- Putin steps in to give Obama a peaceful path out, getting Syria to surrender its chemical weapons and Iran to agree to constraints on its nuclear program. When Putin steps in to protect the interests of those ethnic Russian populations and supports the secession of Crimea (endorsed by 96 percent of voters in a hastily called referendum), your target shifts again. Though you've succeeded in your plan to drive a wedge between Obama and Putin, Putin's resistance to your Ukraine plans makes him the next focus of "regime change." Your many friends in the mainstream U.S. news media begin to relentlessly demonize Putin with a propaganda barrage that would do a totalitarian state proud. The anti-Putin "group think" is near total and any accusation -- regardless of the absence of facts -- is fine. Then, on Sunday, the Times led the paper with a lengthy report on the "Search for Secret Putin Fortune" with the subhead: "U.S. 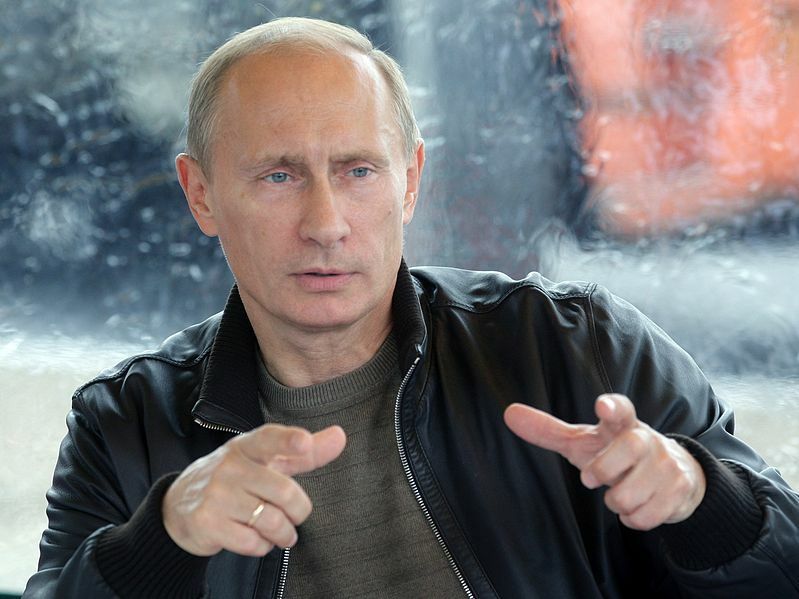 Suggests Russian Leader Has Amassed Wealth, and That It Knows Where." Except the story, which spills over to two-thirds of an inside page, presents not a single hard fact about Putin's alleged "fortune," other than that he wears what looks like an expensive watch. The story is reminiscent of Ronald Reagan's propaganda campaign against Nicaraguan President Daniel Ortega for wearing "designer glasses," a theme that was picked up by the major U.S. news outlets back then without noting the hypocrisy of Nancy Reagan wearing designer gowns and Reagan's beloved Nicaraguan Contra leaders profiting off arms sales and cocaine smuggling. Spreading suspicions about a target's personal wealth is right out of Propaganda 101. The thinking is that you can turn people against a leader if they think he's ripping off the public, whether he is or isn't. The notion that Ortega's glasses or Putin's watch represents serious corruption -- or that they are proof of some hidden fortune -- is ludicrous, but it can serve a propaganda goal of creating divisions. But what would it mean to destabilize Russia? Does anyone think that shattering the Russian political structure through a combination of economic sanctions and information warfare will result in a smooth transition to some better future? The Russians already have tried the West's "shock therapy" under drunken President Boris Yeltsin -- and they saw the cruel ugliness of "free market" capitalism. Putin's autocratic nationalism was a response to the near-starvation levels of poverty that many Russians were forced into as they watched well-connected capitalists plunder the nation's wealth and emerge as oligarchic billionaires. For all Putin's faults, it was his push-back against some of those oligarchs and his defense of Russian interests internationally that secured him a solid political base. In other words, even if the neocons get the Obama administration -- and maybe its successor -- to ratchet up tensions with Russia enough to generate sufficient political friction to drive Putin from office, the likely result would be a dangerously unstable Russia possessing a vast arsenal of nuclear weapons. Putin loyalists are not likely to readily accept a replay of the Yeltsin years.